Having decided not to do a top 10 for January as originally planned given the amount of phenomenal books which wouldn’t have gotten into it, I thought February might be easier – some chance! This was an unbelievably strong month for me, with the vast majority of books I read being very good or better. If you want a quick list of everything rated 4 stars or better, scroll to the bottom of the post. For fuller details, keep on reading! Books read in February – alphabetical by author surname. Me and Earl and the Dying Girl by Jesse Andrews – There is no way a book about a girl dying of leukemia has any right to be this funny. Andrews shows himself to be a hugely accomplished writer here, managing to produce a book which is both moving and hilarious. Strong recommendation. Poison Apples by Lily Archer – Three girls who all have wicked stepmothers decide to fight back by becoming evil stepdaughters in this modern day fairy-tale update. Huge potential which I didn’t think was really realised fully. It was fine, just doesn’t stand out as anything special, with characters seeming a tiny bit flat. The Future of Us by Jay Asher and Carolyn Mackler – I think I was expecting too much from this after Asher’s phenomenal Thirteen Reasons Why. This is a very different book with a much lighter touch than that and I originally felt disappointed by it because of that. Taken on its own merits, it’s a fun story with some interesting thoughts about just how much teenage life has changed since the mid 90’s when I was a teen myself. Torn by Cat Clarke – Twisty tale of a prank which goes horribly wrong, leaving a spoilt mean girl dead and narrator Alice struggling to cope with her involvement in the situation. Superb characters and Clarke’s excellent writing style make this a massive recommendation. I Love You Beth Cooper by Larry Doyle – Stunningly funny and with more depth than it initially appears to have, this crude comedy is along the lines of Don Calame’s novels and the American Pie movies. The film adaptation of this one takes some liberties with the plot but is surprisingly watchable. Mockingbird by Katherine Erskine – Dealing with Asperger’s syndrome, the aftermath of a school shooting, and a grieving family, this is a very ambitious novel which feels a tad rushed as a result of the amount crammed in. It’s still well worth reading, though. Bunheads by Sophie Flack - Introspective tale of a ballet dancer trying to choose between her career and her first boyfriend is detailed and very realistic – as you’d expect, since author Sophie Flack is a former dancer herself. A quiet book but a really good read, this is recommended to all, not just ballet fans. Looking for Alaska by John Green – Staggering. I intentionally avoided reviewing this one because I couldn’t work out ANY way of saying much without spoiling it. If you like heartbreaking, wonderful, and often hilarious books, you need to read this. (In fairness, I’m perhaps the only person who likes YA fiction who HADN’T read this already, so you probably know that.) This was the 7th book I read this month and was comfortably expecting it to win Book of the Month. It got beaten in the end, but it’s still amazing. Brave New Love edited by Paula Guran – Dystopian short story collection. Really hit and miss but with six strong stories including a couple of real gems. Diana Peterfreund’s Foundlings alone would make it worth your while. The Headmaster’s Daughter by Peter Hayden – This was a really interesting read. It’s the tale of a school trying to deal with the death of a beloved headmistress and the new headmaster’s differing views, as well as the boys who are beguiled by his beautiful daughter. Written by teacher along with several pupils who helped him plan it, it captured the atmosphere of the school perfectly. I didn’t do a full review as it seems to be out of print – but it’s well worth picking up if you see it in a library or second-hand bookshop. Clash by Colin Mulhern – Dual narrative of the supposedly psychotic Alex and classmate Kyle, a nice kid and talented artist, both suffering in their home life, is well-written but seemed to have something missing. I can’t really put my finger on it, either, which is why I never reviewed – it’s good and I think a lot of people will really enjoy it, I was just expecting a bit more. Ondine: The Winter Palace by Ebony McKenna – I didn’t like this as much as the first Ondine; that said I absolutely LOVED the first Ondine so this was still pretty good. Worth a read if you want a comic fantasy with a light touch. Pulse by Tricia Rayburn – FINALLY got this one after realizing it was book 2 in the series, not book 3 as I’d originally thought. (For people as confused as I was, this is called Undercurrent in the US.) I wasn’t as impressed as I was by Siren – Vanessa’s boyfriend Simon fades into the background a bit and it becomes a bit of a standard ‘love triangle’ novel. Still pretty good and fans of paranormal romance should find it well worth checking out. Get A Life by Laura Peyton Roberts – Picking this up as a freebie for Kindle, I was very pleasantly surprised by the quality. It’s the story of a group of mismatched teens at Clearwater Crossing High School who come together to fundraise for a friend diagnosed with leukemia. Despite being a bit on the twee side now and again, it’s generally a pleasant read with some very likeable teens – notably Peter and Jenna, in rare portrayals of realistic committed Christian characters. There are 20 in the series, and while I’m not quite convinced I’ll read the entire run, I’ve splashed out the princely sum of 77p on book 2, Reality Check, and am looking forward to seeing what happened next. Desert Angel by Charlie Price – Tense and taut thriller. I prefer books which have better character development personally, but this is an exciting read where the pace never lets up as Angel tries to evade the man who killed her mother. Black Heart Blue by Louisa Reid – 2012 is set to be an incredible year for debut authors judging from what I’ve seen so far. This tale of two twin sisters – one disfigured and one dead, abusive parents, and people who’ll turn a blind eye to terrible happenings proclaims Reid as a phenomenal talent. That said, you’ll need a strong stomach given the contents. If you can handle it, though, a riveting and thought-provoking read which I’m guessing will be winning some big awards. Putting Boys On The Ledge by Stephanie Rowe – Short but really engaging, I enjoyed this novella despite it being a tad predictable. I loved central character Blueberry and look forward to reading the other three books in the series focusing on her three friends. I particularly recommended it to teens who don’t read much, given the short length and breezy writing style. Dead Rules by RS Russell - Um, yeah. The first of this year which I really, really, didn’t enjoy. Two dire main characters and a boring plot made this a rare miss for the usually super-reliable Quercus Books. Oliver Twisted by JD Sharpe and Charles Dickens – Sharpe takes some original passages from the classic Oliver Twist and throws supernatural stuff around them. It’s an intriguing idea which has something for everyone – the pleasure of recognising the original parts for Dickens fans, and a bloodthirsty thriller for those new to it. Possibly quote of the year so far with the tagline ‘Please Sir I want some GORE’. A Witch in Winter by Ruth Warburton – Super spooky, fabulous narrator, brilliant love interest and an exceptional location of a coastal town where nothing is quite what it seems. Huge recommendation and I can’t wait for book two! The Book of Blood and Shadow by Robin Wasserman – Not quite sure how I didn’t get around to reviewing this. It’s a teen Da Vinci Code type novel with great action and an interesting plot. Completely farfetched and unbelievable in the same way as a lot of these types of novels are, it’s still well worth your time. I’m really surprised it’s not being marketed as a crossover – it more than holds its own against the majority of adult books in the genre. The Alchemy of Forever by Avery Williams – Paranormal romance has some good points – notably the idea of Incarnates, who transfer their souls into others’ bodies so they can live forever. It’s rushed, though, and the characters aren’t great. Reasonable for genre fans. Skin Deep by Laura Jarratt – I didn’t bother with the drum rolls or fanfares; this was a foregone conclusion to anyone who reads my Twitter regularly as I haven’t stopped raving about it since reading it. The best of the 70+ books I’ve read this year by quite some distance, Laura Jarratt tells an incredible story, looks at disfigurement, discrimination and grief, and creates an incredible central pairing and wonderful supporting characters. An absolute must read. The Death Defying Pepper Roux by Geraldine McCaughrean – Boy whose death on his fourteenth birthday is foretold runs away on that day, has madcap scrapes, and takes several other identities. I’ve read so many reviews saying this is incredible that I had really high expectations and felt a bit let down. That said, it’s pretty good – but the level of whimsy was a bit too high for me personally. 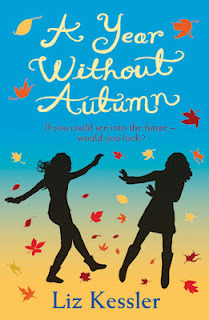 A Year Without Autumn by Liz Kessler – Given I barely read any MG this month, it feels a bit silly actually awarding a Book of the Month. This was so good, however, that I’ll do it anyway. After a slow start, things get going really quickly as main character Jenni accidentally gets pitched forward a year in time and finds out that tragedy has struck – can she somehow go back and change the past? Really thought-provoking in the way it deals with the ripple effect an event can have, this is a fantastic book and a huge recommendation.